Samsung: "Blu-ray no longer a big selling point" | What Hi-Fi? Samsung: "Blu-ray no longer a big selling point"
Blu-ray is no longer a big selling point for Samsung - it's more important that the products are Smart. That's the verdict of Samsung's AV product manager, Chris Moseley, who was speaking to What Hi-Fi? Sound and Vision at Samsung's European Forum in Prague. 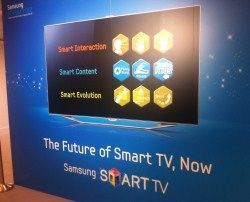 The event, which saw all Samsung's 2012 products being showcased in Europe for the first time, was dominated by talk of Smart TV. "Smart Interaction, Smart Content and Smart Evolution" was again a key phrase, and it's clear that Blu-ray, not to mention 3D, has been pushed down the pecking order. Talking through the company's AV range, which includes a small selection of Blu-ray products, it was clear the inclusion of Smart internet content and web browsing was the priority across all home cinema devices. Moseley said: "Blu-ray is not really a big selling point any more. The fact that a product plays discs is a secondary factor, the main thing is that it's Smart." "With supermarkets doing Blu-ray players so cheaply we have to add extra value." The company's Smart Hub of content became the first in the UK to include Netflix and the first to offer 5.1 Dolby Digital sound on streaming movies from Acetrax, both offering plenty of competition for Blu-ray discs. Moseley says the company's main push in the Blu-ray sector will be its new pair of compact BD players - but with the focus on their Smart networking capabilities and compact looks. The BD-ES5000 may creep just under the £100 mark and sports All Share Play networking and YouTube, while the BD-ES6000 supports 3D Blu-ray, has WiFi integrated and access to Samsung's Smart Hub and web browser. It remains the case that if you want the highest quality HD video and sound, and without the need for a top-notch broadband connection, Blu-ray is the answer. But after launching a Smart TV add-on for any TV earlier this year, and now relegating the disc-spinner to playing second fiddle even within Blu-ray players, it's clear Blu-ray has slipped down Samsung's priorities.